Western Prodigy Multi-Position Winged Snow Plow automatically positions its patented mechanical wings to deliver maximum plowing efficiency, whether in straight-ahead scoop mode or when angled for windrowing. 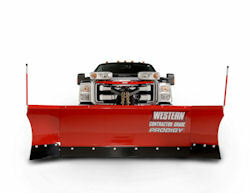 The plow is available for truck and skid-steer loader applications. The UltraMount 2 mounting system now features a one-piece frame design for added strength and durability.